This chapter focuses on reshaping intellectual capital formation via electronic-based learning platforms. 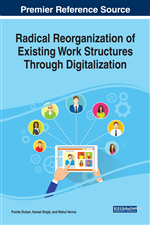 A critical examination of the literature on human capital development through e-learning was conducted and it was found that digitalization enhances teaching / learning processes and activities, rather than rendering the traditional methods obsolete. The commonly used learning management systems are Blackboard, Class-Front and WebCT. With various virtual learning platforms such as game-based learning, mobile learning, social learning, and virtual world learning, the teaching and learning environments are being extended. The evolution of high levels of sophisticated information technologies across the globe has tremendously improved intellectual capital formation through digital collaboration, and interactions. Therefore, it takes continuous update of intellectual assets through digitized processes to keep abreast of vast innovations and technical know-how. The principal aim of this chapter is to present a report on intellectual capital development via electronic-based learning. The idea of reshaping intellectual capital formation through digitalization has become more prominent as a result of technological innovations. The evolution of various electronic gadgets in educational industries across the globe renders traditional teaching and learning platforms obsolete. Organizational development (OD) practitioners, higher education institutions and individuals should be flexible in responding to the relevant complexities and technical innovations. Technological innovations render previously acquired (old) skills or competencies obsolete within a short period (Allen & Velden, 2012), suggesting the need for continuous update of skills and dynamic capabilities (Atiku, Chitakunye & Fields, 2014). In this digital age, skills and competencies can be easily upgraded through digitalization. The traditional approach to human capital formation could be upgraded by taking advantage of technological advancements in the 21st century. Teaching and learning at higher institutions, as well as training and development interventions at corporate universities, are becoming more digitized to disseminate knowledge effectively in the global economy. For example, virtual reality of online learning environment are being explored using smart glasses as an effective way of enhancing human capital formation in the digitalized economy. In this context, distance is no longer a barrier for teaching and learning in the 21st century. Vital knowledge is speedily disseminated across all the continents, putting IT/internet or digitalization at the centre stage (Helbing, 2013, Pappas, 2017). One of the fundamental challenges facing developing countries is the cost of acquiring infrastructural facilities for knowledge creation through digitalization by individuals and institutions of higher learning. In specific terms, African countries are confronted with poor infrastructural facilities essential for e-learning. Unlimited internet connection as a basic means of livelihood in the Western countries remains a luxury in many African countries. In spite of the cost implications of an electronic-based teaching and learning platform, it remains one of the most effective ways of enhancing intellectual capital development across the globe (Salas & Gelfand, 2013; Sambamurthy, Bharadwaj & Grover, 2003). This chapter seeks to uncover the benefits of intellectual capital formation through digitalization. In view of the huge capital requirement for full digitalization of teaching and learning in the 21st century, a blended learning approach, which is a combination of face-to-face or classroom teaching and online learning, might be more appropriate for developing countries in Africa. The author does not subscribe to the idea of total eradication of traditional teaching and learning methods in the 21st century. It is submitted that traditional teaching and learning approaches could be upgraded through digitalization to improve the competence-based levels required in this millennium. It takes continuous update of intellectual assets through digitized processes to keep abreast of vast innovations and technical know-how.